Outsourcing order fulfillment is the preferred channel by both small and large ecommerce retailers. Order management eats up time and doesn’t generate additional revenue to what sales and marketing have already put on the table. But it’s a critical part of your business. Rather, this process is best assigned to a specialized order fulfillment services like Rakuten Super Logistics. How does Rakuten Super Logistics work? Who can use Rakuten Super Logistics? What are the features or Rakuten Super Logistics? What is the pricing of Rakuten Super Logistics? Is Rakuten Super Logistics for you? Rakuten Super Logistics is an outsourced cloud-hosted order fulfillment service for ecommerce retailers with high-velocity delivery requirements in the U.S. or abroad. It has seven strategically located warehouses across the U.S. and an international network of shippers. Several Rakuten Super Logistics reviews have shown that the provider can reduce fulfillment overheads and, more importantly, allow you to focus on your core task, that is, growing the business. Likewise, as a specialist in the field, fulfillment companies like Rakuten have the agility and expertise to keep your deliveries in time and accurately, and build a positive reputation with your customers. 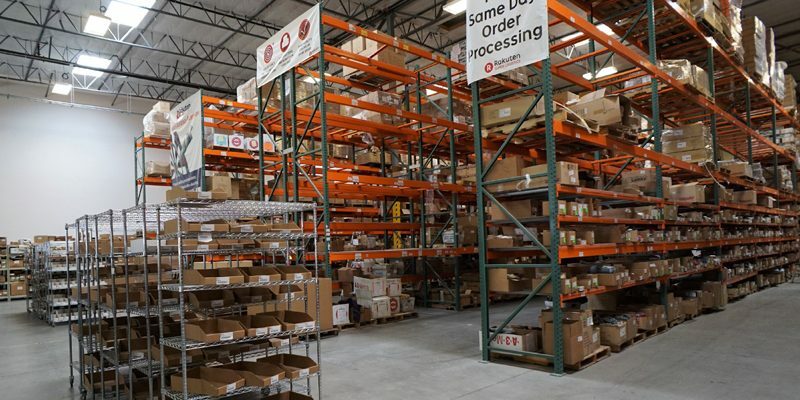 One of 12 Rakuten Super Logistics warehouse facilities in the U.S.
Should you avail yourself of its marketing services? The company also provides other business services that help you grow the business. These include marketing services, marketplaces for your products and customer loyalty program. However, it is best to attribute marketing to a specialist agency or to a CRM or marketing automation software that has a more in-depth understanding of this field. This thinking is in the same breath as you would want to use Rakuten for logistics because that is its expertise. 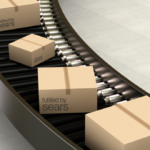 Order fulfillment is fast and simplified. An order is made on your online shop. The order is synced with the nearest Rakuten fulfillment warehouse. Fulfillment center processes and ships the order to the customer via Rakuten shipping partners. Return items are sent back to the fulfillment center and follow your prescribed process. When you maximize all of Rakuten’s domestic fulfillment centers, a two-day delivery is 98% guaranteed anywhere in the U.S. via ground transport. Likewise, a smart calculator, the SmartShip Optimizer, uses advanced analytics to estimate the cheapest delivery route, while keeping delivery within the prescribed period. By leveraging shorter delivery routes, you can save about $2.36 on shipping cost per order. 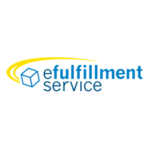 Order fulfillment is made efficient with Rakuten Super Logistics (RSL) SmartFill™ and its close integration with major ecommerce platforms, including Walmart Marketplace, eBay, Magento, Shopify, Amazon, Bigcommerce and PayPal. Setting it up is fast in four easy steps. Set up your SmartFill™ account by integrating your shopping cart system with RSL SmartFill™ and making sure that your products are placed into any of the seven fulfillment centers. Test SmartFill integrations and once tests are completed, prepare your inventory for receiving orders. Rakuten Super Logistics uses SmartStock Accelerated Inbound Receiving to process your inventory. Once the inventory is processed and the orders are confirmed to be available, the orders will be prepared for shipment within two business days through the order fulfillment service. Use standard packaging or add customized messages to packaging slips for your customers. Once this is done and your shopping cart integration with SmartFill is completed, orders, delivery information, etc. will be automatically fed from your shopping cart to SmartFill. Rakuten Super Logistics is ideal for ecommerce businesses of any size, but it’s most ideal for small, medium-sized and large companies without in-house fulfillment resources. The service provider requires a minimum of 250 orders per month to facilitate fulfillment; it can handle 10,000 and more orders per month with an enterprise plan. U.S.-based ecommerce retailers. They can leverage Rakuten Super Logistics’ strategic warehouse locations in the country and offer 2-day shipping to customers. 24/7 global order fulfillment needs. Orders can come from anywhere at any time. An outsourced service ensures that your fulfillment is in full gear even when you’re offline or away from. Recurring volume orders. It is easy to stock up on your items in strategic Rakuten fulfillment centers spread out in the U.S.
Fulfillment with integrated marketing services. Rakuten offers marketing services, online marketplace and digital rebates program on top of its cloud-hosted order management system and freight services. What Problems Does Rakuten Super Logistics Solve? It’s easy to see the immediate benefits when you outsource your fulfillment to Rakuten Super Logistics. Lower fulfillment overhead costs. 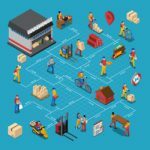 The costs associated with putting up your own fulfillment center is astronomical. Costs include renting or owning warehouse facilities, staffing, installing the system, managing a transportation fleet, etc. You can bypass the need for capitalization and, instead, cost in fulfillment into your pricing as a manageable operational expense. Ensures on-time and accurate delivery of your product. Fulfillment specialists like Rakuten Super Logistics have extensive experience in order management and freight. They know the problems to anticipate and arrest these issues before they blow over, or know the clear steps to be taken to address serious and urgent circumstances. Frees up your time for revenue-building tasks. Fulfillment, although critical to your business, robs you of time to pursue revenue-generating activities like sales and marketing. With someone handling this time-consuming process, you have more time to think of business strategies that will further grow the company. 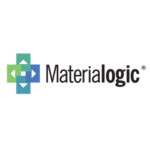 Leverage insights on your fulfillment data. The service provider uses advanced analytics that helps you see patterns or trends in your fulfillment activities. For example, you can aggregate data on products with a high return rate or sort the best-selling items. These insights help shape your business decisions. Regulatory compliance. Customs clearance and freight taxes are a big headache for sellers and exporters. If you lack a clear understanding of this side of the business, Rakuten Super Logistics has the experience, expertise and network to make government compliance smooth sailing.  What are the Features of Rakuten Super Logistics? Cloud-Based order fulfillment and inventory system. This streamlines and automates the order and inventory processes. It integrates with major ecommerce platforms. Likewise, it features inventory alerts for restocking to prevent stockouts or overstocks. The system also features order management analytics that helps you spot trends and insights in your fulfillment processes. eCommerce freight services. Through its shipping partners, Rakuten Super Logistics offers pickups and drop-offs and expedited shipping. It also manages local regulatory requirements and provides guidance for global manufacturers. Support. A dedicated support team is assigned to you and is based in the fulfillment center where your items are. The provider guarantees to respond in three hours at most. Furthermore, the fulfillment centers are open for your inspection and see how your items are being handled. RSL SmartFill. A fulfillment software that seamlessly integrates with major shopping carts and marketplaces online. It also supports API customization for unsupported shopping carts. SmartShip Optimizer. Using advanced analytics, it computes the shortest delivery route with the least cost on you. SmartShip. Ships out items within the day of order receipt at any Rakuten Super Logistics site. SmartFreight. A turn-key solution for local and international freight with customs guidance and clearance support. Pricing is by quote and based on the monthly order volume. The service provider requires a minimum of 250 orders per month to facilitate fulfillment service. It can also manage 10,000 and more orders per month. Likewise, pricing may also based on inclusions, broken down in Rakuten Super Logistics’ main services: order fulfillment services; ecommerce freight; dedicated client support; and ecommerce smart tools. There are plenty of resources for Rakuten Super Logistics reviews and most of them validate our general assessment: it is a cost-effective alternative to in-house fulfillment. Although you will probably base your decision to use this service on pricing (you need to contact them for a specific quotation), consider also the benefits and feature we discussed above. If you have a clear strategic plan to focus the day-to-day operation on revenue-generating activities, Rakuten Super Logistics fits your goal. These guys don’t even deserve one star! For those who don’t want to read the rest of my review, let me make it easy for you. RUN FAR AWAY FROM THIS COMPANY!!!! As a business owner who started in a garage and grew a multimillion dollar enterprise, I’m honored and feel obligated to warn all other entrepreneurs of dangerous companies like Rakuten Super Logistics. Don’t let the salesman fool you to thinking they can do everything they promise you. Don’t be fooled into thinking they’ll be responsible for the hundreds of thousands or millions of dollars of product you’ll send them. This 3pl was hands down, the worst company to deal with. They were so bad to deal with I opened my own fulfillment center for our business. After working with the unethical people at RSL, I vowed to never use another 3PL. They lost our products, shipped the wrong products to our customers, charged us hundreds of thousands of dollars in hidden fees, charged us at 150lbs per box when our items only weighed 30lbs and the list goes on and on. They we’re also true masters of creating the worst nightmare imaginable when we tried to leave them. If you’ve ever seen the 1990 movie “Misery” starring Kathy Bates, you’ll understand the picture I’m trying to paint, my experience with Rakuten Super Logistics was the definition of horrific abusive captivity! Let this be your warning. Just don’t do it!